A man was injured and another died after part of a floor collapsed this morning at a Maplewood restaurant. The incident happened at Coda Kitchen and Bar at approximately 9:10am.The restaurant, located in the Maplewood Village Business District at 177 Maplewood Avenue, was under construction at the time of the incident, and was not open to customers. Officials reported that while three construction employees were working on installing a staircase in the basement, part of the first floor collapsed into the basement, trapping the employees. A press conference was held at approximately 12:45pm, where Maplewood mayor Victor DeLuca and Chief Michael Dingelstedt of the Maplewood Fire Department spoke regarding the incident. Mayor DeLuca called what happened "an unfortunate accident". DeLuca said that there were valid construction permits, and that the building passed inspection on May 28. The mayor also noted that the all surrounding buildings were evacuated, and that the building which Coda is located in was condemned. "It's very sad", DeLuca continued, "These things don't happen here. These buildings are in good shape...Our hearts go out to the family, this is a person who went to work today expecting to come home tonight, and they're not going to be there". Maplewood Avenue is currently closed near Baker Street, as is Dunnell Road near the Maplewood Train Station. Mayor DeLuca told Essex County Place that schools were unaffected, however "this is having a major impact on businesses". Caution tape was placed on sidewalks near the incident, preventing pedestrians from accessing certain businesses. While the Maplewood Fire Department and several other North Jersey emergency agencies were working on Maplewood Avenue, fire departments from South Orange, Irvington, and Millburn were handling other emergency calls. "I want to applaud our first responders", DeLuca mentioned, saying that the Maplewood Police arrived on scene first, and rushed into the basement without any equipment. Columbia High School principal Kirk E. Smith made an announcement to students regarding the incident. In an email to parents, Maplewood Middle School principal Jeffrey Truppo said, "the Maplewood Police Department has informed me that there has been an internal floor collapse in one of the restaurants in Maplewood Village. While our school is not in danger, I have been asked to keep all students and staff in the building because of the volume of emergency vehicles. I have also been informed that roads leading to our school have been blocked for safety reasons. As a result of our proximity to Maplewood Village, our students and staff can hear the emergency vehicles and news helicopters. I have informed our students about the situation, and explained that I will update them about any instructions for dismissal I may receive from the MPD later this afternoon. As I write this to you students are in classes where they are supposed to be, engaging in their work as they would on any other day". The deceased man was identified as Guo Tai Chen, 50, of Flushing, Queens, NY. Once rescued, the injured construction worker was rushed to University Hospital in University Heights, Newark. The Maplewood Police Department, Maplewood Fire Department, Essex County Prosecutor's Office, and the Occupational Health and Safety Administration are investigating. Send your story ideas, photos and comments to placenjwebsites@gmail.com. Dr. Brian Osborne, the superintendent of schools in South Orange and Maplewood will become the superintendent of the a school district in Westchester County, New York, according to a local news website there. Talk of the Sound News reports that Dr. Osborne will become superintendent of the New Rochelle City School District, which serves over 10,000 students. Dr. Osborne did not respond to requests for comment. Submit your news, comments and photos to placenjwebsites@gmail.com. A new business has opened in Downtown South Orange. Called the South Orange Jewelry and Art Exchange (SOJAX), a grand opening celebration was held from 10am to 8:30pm on Thursday. SOJAX is located at the former location of the Robyn Ross Women's Clothing and Jewelry Boutique. The exchange will feature several local artists and jewelers, who will be operating independently in a shared space. Owner Ross Fields, the former co-owner of Robyn Ross, told Essex County Place that after his wife Robyn moved on to another career, and the store was closed, he "tried to figure out how to transform the space". Fields said he was inspired by jewelry exchanges in Midtown Manhattan's Diamond District. "Jewelry and art go hand in hand", Fields explained, "The arts community is very big in this town. Once I got the concept, it was well welcomed by the community". Vendors slated to be part of the exchange include Arts Unbound, Compelling Images Fine Art, Robyn Ross Designs, Michelle Billete Design, Pamela Bloom Jewelry, The Exceptional Artisan, ASG Creations, and Goldstein Jewelers. Several national retail chains have announced plans to open locations in Livingston. 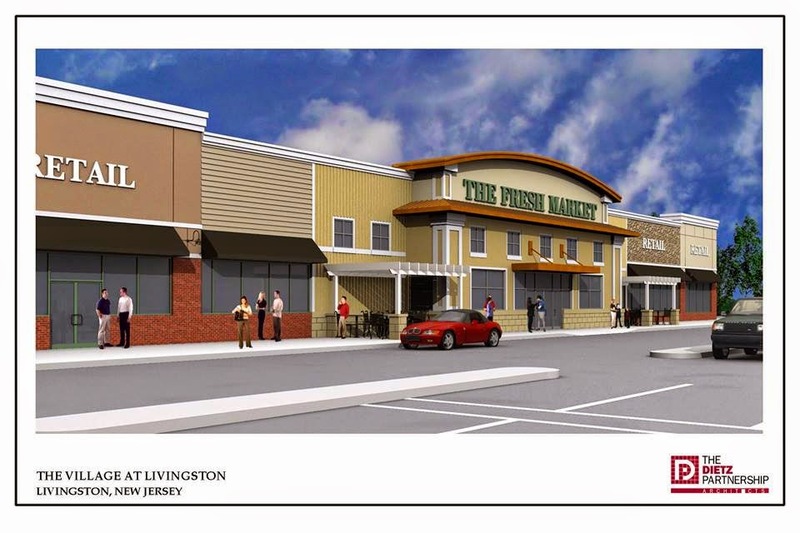 The Fresh Market, a gourmet supermarket chain, will open a store in the former location of Pathmark in the Village at Livingston shopping plaza at 277 Eisenhower Parkway. According to a press release, "The Fresh Market continues to grow its chain of specialty grocery stores and has signed a lease for a new location in Livingston, N.J. The store (is) expected to open in the fall of 2014...Once opened, it will be the company's third store in the state". Other New Jersey locations currently include Bedminster, Somerset County and Montvale, Bergen County. Drewry Sackett, the Public Relations and Community Relations Manager for The Fresh Market told Essex County Place, "We are always on the lookout for markets where shoppers appreciate high-quality food and outstanding customer service, and Livingston is just such a place. We look forward to serving this community and providing residents here with The Fresh Market’s unique shopping experience". Sackett added that 90 new jobs will be created. Other retailers will be opening locations in Livingston in the near future include buybuy BABY and Cost Plus World Market. Both stores will be located at 530 W Mount Pleasant Ave (Route 10), in the plaza where Borders Bookstore, Circuit City, and Old Navy used to be located. The plaza has been vacant for several years. In an email to Essex County Place, Leah Drill, a spokesperson for buybuy BABY and Cost Plus World Market parent company Bed Bath & Beyond Inc, said "as we continue to grow and open stores, we are always looking for new locations where we will be able to offer our new customers the broad assortment and outstanding customer service that is buybuy BABY. Livingston is such a location and we are very excited to be coming there". According to Drill, the store will be approximately 25,000 square feet, and is scheduled to open this summer. buybuy BABY stores carry infant and toddler merchandise. In regard to the new Cost Plus World Market, Drill said "We’re especially thrilled to be opening our first Cost Plus World Market store in the Northeast in Livingston, NJ. We think the residents of Livingston and surrounding areas will be excited to shop a new store that is unlike any other specialty retailer". Drill added that the Cost Plus store will be around 17,000 square feet and is also expected to open this summer. "We are thrilled and look forward to the openings", Beth Lippman of the Livingston Area Chamber of Commerce told Essex County Place, "We think it will help bring people and as a result help all businesses located in Livingston". Submit comments and story ideas to placenjwebsites@gmail.com. Since March, the Jersey Animal Coalition shelter in South Orange has been closed, and animals have been prohibited from leaving the shelter. However, posts on the Jersey Animal Coalition Facebook page indicated that animals from the shelter would be up for adoption at a Ridgewood, Bergen County event on May 18. Sponsored by the Ridgewood Veterinary Hospital, the event was called 'Adopt-A-Pet' Day, and nearly 25 animal rescue groups and shelters from several areas participated. Over 300 pets were to be available for adoption, and several pets from the JAC shelter were slated to be available for adoption at the event. One post read, "Jersey Animal Coalition will be...participating in this huge adoption event...Come and meet our adoptable pets, our great staff and volunteers...". Another mentioned, "Brownie is one of the dogs you'll meet on Sunday at the Ridgewood Veterinary Hospital's Adoption event! Stop by and meet Brownie and the JAC's other adoptable pets on this Sunday, 5/18 starting at 11 a.m". However, South Orange Village officials ended up prohibiting JAC from participating. In an email to Essex County Place, Deputy Village Administrator Adam Loehner said, "JAC did reach out through their lawyer on Friday though unfortunately because of the quarantine we were not able to allow them to participate in the adoption event in Bergen County". Ridgewood Veterinary Hospital and Jersey Animal Coalition did not respond to requests for comment. Send comments and story ideas to placenjwebsites@gmail.com. Eugene 'Gene' Chyzowych, who retired in 2013 as physical education teacher and soccer coach at Columbia High School in Maplewood, passed away on Saturday, May 10 due to illness. Chyzowych, who was 78. was employed by the South Orange Maplewood School District for over 50 years. Chyzowych, often referred to as 'Coach C' by students, received the Walt Chyzowych Lifetime Achievement Award in January from the National Soccer Coaches Association of America. Chyzowych also served as a girls volleyball coach at CHS, and was a coach for the the United States Men's Soccer National team. Officials with the South Orange Maplewood School District are reacting to the passing of Chyzowych. In an email to Essex County Place, SOMSD Physical Education supervisor Judy LoBianco said, "There is a profound sadness and sense of loss for a man that had a giving heart and a caring soul. He taught for so many years because he loved his students and his work". Columbia High School Athletics and Students Activities Director Larry Busichio told Essex County Place that, "we are deeply saddened by the passing of Coach C. Coach Chyzowych was a pioneer in the sport of soccer. It truly was his love. You're talking about a man who won over 700 games and basically help build high school soccer on the east coast. He was really the first high school coach to begin a feeder program from the rec level up to the high school. He was such a positive influence for so many people ranging close to 50 years at Columbia High School. Not only in soccer, but also in girls volleyball where he ran an undefeated record for close to 10 years. He loved to talk about coaching, and I always appreciated our talks over coffee when I became the baseball coach at Columbia. He didn't care what sport you were a part of, he loved to lend advice and loved sports in general. He was a pleasure to be around, and he will be missed". On Columbia Cable Network Monday morning, CHS Interim Principal Kirk E. Smith told students that Chyzowych was "more than just a soccer coach, (and) more than just a teacher". Smith said that the school will conduct a moment of silence in remembrance of Chyzowych in the near future. Visitation will take place today (Monday) from 6:00pm to 9:00pm at Quinn Hopping Funeral Home at 145 E. Mt. Pleasant Ave in Livingston. The funeral service will take place at 9am on Tuesday, May 13, at Saint John's Ukrainian Catholic Church, 60 North Jefferson Rd in Whippany. The South Orange Rescue Squad has announced that several fundraisers will be held throughout 2014 in order to raise money for their new headquarters. The SORS headquarters had been located on Third Street for over 40 years, however it has since been torn down in order to make way for the Third and Valley mixed use development. SORS has been located in a converted house and garage on Fourth Street since March. According to SORS captain Dan Cohen. the first fundraiser will be held on Saturday, May 31 from 9pm to 12am at Bunny's Restaurant, 14 West South Orange Avenue in South Orange. The "fundraiser at Bunny's will be a fun night of music, food, drinks and a live auction of lots of great prizes and gift certificates from local merchants", said Cohen. "Admission is free but a portion of the bar proceeds will be donated to SORS and in addition to the auction, there will be opportunities for people to make a donation". The new headquarters will be located on Sloan Street next to the South Orange Fire Department headquarters. Cohen added that although the Jonathan Rose Companies, the developer for Third and Valley, donated $1.1 million to pay for the new headquarters. "we need to raise more in order to complete the project and furnish the building". Those willing to donate to SORS can send donations to South Orange Rescue Squad 13 Fourth Street South Orange, NJ 07079. Elizabeth Aaron, who will become principal of Columbia High School this summer, spoke to Essex County Place about her plans for the 2014-15 school year, and about the current school year. Aaron is currently in her first year as an assistant principal at the Maplewood high school. Aaron, a 16 year resident of Maplewood, has children who are students at Clinton Elementary School. “I love Columbia High School”, said Aaron, “the students have been really welcoming, the teachers are extremely smart, and parents, students, and teachers have been really open”. When asked about what problems she feels exist in the school, Aaron responded “I don't necessarily see problems as much as I see opportunities”. Aaron said that she would like to improve the lunch items which are served at the school. “There are not enough fruits and vegetables being served”, Aaron said. According to Aaron, “the more engaged parents are, the better their children tend to do in school. This year we've done a pretty good job of troubleshooting and problem solving”. Aaron will be replacing Interim Principal Kirk E. Smith, who became principal after the sudden retirement of Dr. Lovie Lilly in Summer 2013. When Essex County Place visited the Jersey Animal Coalition (JAC) shelter on Tuesday, May 6, JAC president and founder Ruth Perlmutter was sitting on a bench outside the shelter, looking at the bills which had just arrived in the mail. "We've had ongoing bills and no income", said Perlmutter, who founded JAC in 1988. The shelter, which is located off Walton Avenue in South Orange, is currently under quarantine. It was closed after a joint inspection by the South Orange Department of Health and the New Jersey Department of Health in March. Since the closure, stray animals from South Orange have been taken to Associated Humane Societies in Newark. “Adoptions were a big part of our income”, Perlmutter told Essex County Place. Since the shelter is closed, and no animals are permitted to leave the facility, adoptions cannot take place. “People are waiting to adopt certain animals”, said Perlmutter. However, multiple posts by JAC on their Facebook page indicate that many animals are available for adoption despite the closure. One post from May 6 asks followers to “please adopt” a cat named Tiger Lily, and other posts provide links to adoption applications. In fact, as of May 7, there is little indication on the Facebook page that the shelter is closed. When asked about what donations are needed by JAC, Perlmutter simply said, “we need money”. According to Perlmutter, gas and electricity for the shelter costs approximately $4000 per month, and JAC is running out of money to keep the shelter in operation. JAC has been considering hosting a car wash in order to raise money, Perlmutter said. However Nancy Schetelick, a former volunteer coordinator for JAC, warned against giving monetary donations to the coalition. “No monetary donations at all”, Schetelick said in an email to PlaceNJ.com, “No one knows where the money goes and I for one stopped sending in monetary donations over a year ago”. Schetelick recommended that those interested in donating to the shelter should donate supplies so that the animals are not unclean and hungry. “At least with supplies, they cannot turn around and sell them for money, they have to use them for the animals”, said Schetelick. One of the primary reasons for the shelter closure had been because three cats had been infected with ringworm. Perlmutter claimed that the cats have since been cured, however South Orange Village Deputy Administrator Adam Loehner told Essex County Place that "we are not aware of this as the only communication with the JAC at this time has been through their lawyer regarding the case". JAC was charged in March with over 50 violations. Not guilty pleas were filed last month by JAC attorney William Strazza. At the time, South Orange Municipal Prosecutor Gracia Robert Montilus said that he expects the case to move towards trial after the discovery period. Perlmutter had originally been facing two unrelated violations dating back to February, however charges were dismissed by a municipal court judge in April. However, despite the various legal troubles JAC is facing, Perlmutter said that the animals who live in the shelter are “still being very well taken care of”. She continued by saying that one of her biggest concerns is “that the animals are going to (the AHS Shelter in) Newark”, which unlike JAC, is not a no-kill shelter. When a citizen stopped to ask whether the JAC shelter had reopened, Perlmutter assured that the shelter would reopen soon. “No one benefits from us being closed...certainly the animals are not benefiting...We look forward to welcoming the public when we reopen”. Maplewood, New Jersey: The 7th annual Maplewood Green Day Celebration will take place later this month. 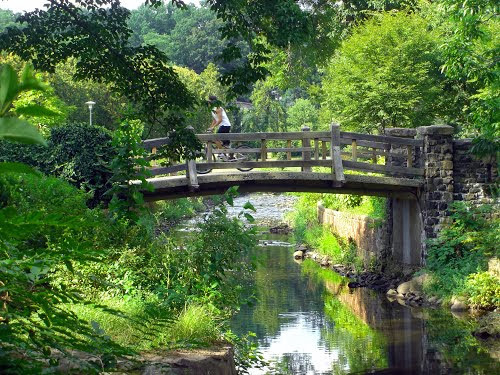 According to the Green Day press release, “Maplewood, New Jersey is hosting the 7th annual Green Day fair to demonstrate simple ways that every person can make more planet-friendly, sustainable choices in their everyday lives”. 4000 people are expected to attend Green Day this year, which will be held on May 17 from 11am to 4pm at Memorial Park. More than 70 ‘green’ vendors and exhibitors will take part in the event, and nearly a dozen local or organic restaurants and farms will be serving food to visitors. Live bands will be performing throughout the day, including the David Easton Band, Flamenco-Jazz, Hush, Western Spur, and Kelly Jin-Hendel. Activities will include Live Animals of the Rainforest presentations by Rizzo’s Reptiles, kids learning activities with a hands-on science show by Vinny Voltage, demonstrations of backyard composting, local food cooking, and cloth diapering, and a 25-foot tall rock climbing wall, face painting, and kid’s environmental games. Free monitored bike parking will be available. Green Day sponsors include the Maplewood Township Committee, PSEG, EcoMatters, Eco Friendly Printer, Soda Stream, Waste Industries, Able Baker, NJ Clean Communities Council and PUR20. To learn more, visit www.maplewoodgreenday.org. If you use Irvington Avenue in Maplewood, the North Jersey Sustainable Communities Consortium (Together North Jersey) would like to here from you. 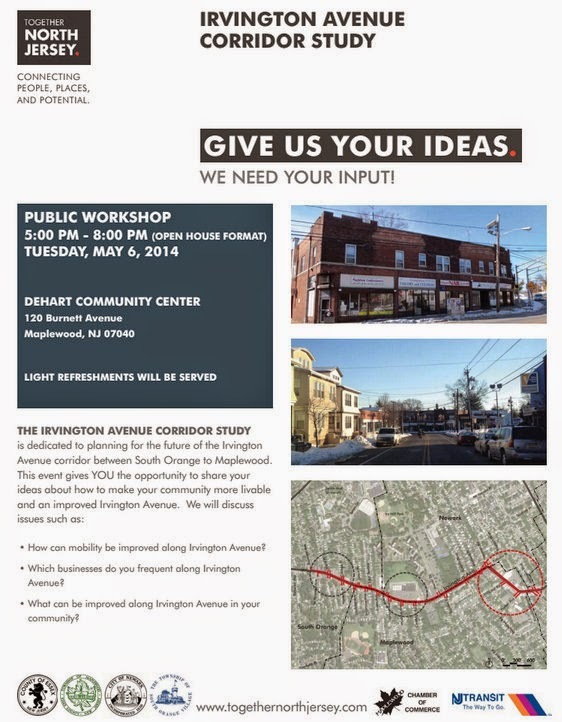 The organization has announced that a public workshop will take place on Tuesday, May 6 from 5pm to 8pm regarding a study to improve the Irvington Avenue area. Called the "Maplewood Irvington Avenue Corridor Study", the objectives include "evolving the Core Study Area (which is on Irvington Avenue between Putnam Street and Franklin Terrace) into a more cohesive neighborhood retail district with stronger connections to the broader Maplewood community". In addition, the study aims to "identify transportation, pedestrian and bike access improvements", "identify streetscape improvements that will create a healthy, enjoyable and safe environment and ensure social and economic beneﬁts", and "identify untapped resources, potential neighborhood stewards and viable incentives for residents that will promote revitalization in the Core Study Area"
Businesses in the core study area currently include 7-Eleven, Extra Supermarket, Town and Country Pharmacy, Mapleton Confectionery, Camptown Cleaners, Osibisa Tropical Supermarket, Studio 7 Hair Salon, Diamond Gym, Valley National Bank, Essex Division Telephone Federal Credit Union, and Sudz King Laundromat. The area is served by NJ Transit Bus 107, which connects the South Orange Train Station with Port Authority Bus Terminal in New York, and Bus 37, which connects Ivy Hill in Newark with Newark Liberty International Airport. Other parts of the study area include the area around the Ivy Hill Plaza near the South Orange/Maplewood/Newark border and the Irvington Avenue Business District in South Orange. The public workshop will be in open house format, and will take place at the Maplewood Community Center in Dehart Park, at 120 Burnett Avenue in Maplewood. Refreshments will be served. Attendees can discuss what improvements they would like to be made to Irvington Avenue, and what businesses they currently frequent, with representatives from the project team. "We hope to hear from area residents how they use Irvington Avenue", Annisia Cialone of the Perkins Eastman planning firm, which is part of the project team. Other organizations on the project team include New Jersey Transit, Fitzgerald & Halliday, Larisa Ortiz Associates, and the Nishuane Group. The project began in February and completion of it is expected during the Summer. 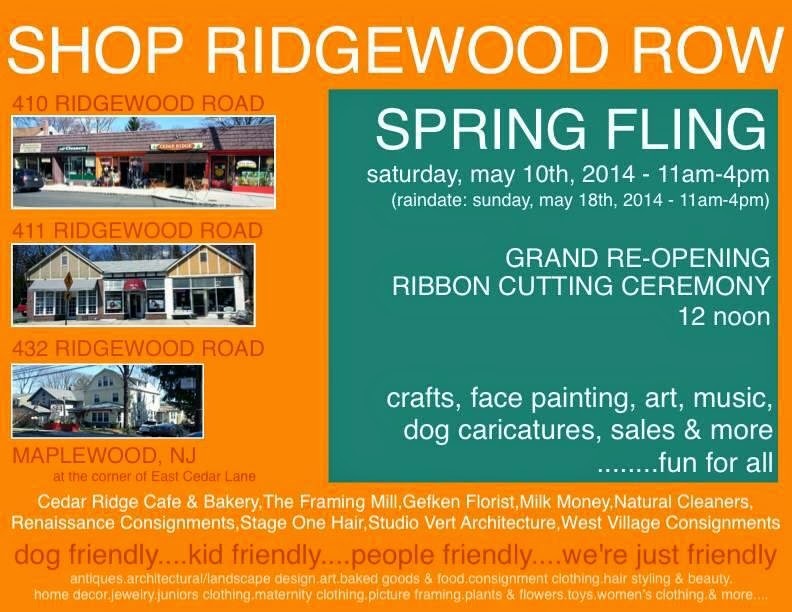 The businesses of 'Ridgewood Row' in Maplewood will be holding a 'Spring Fling' and Grand Reopening on Saturday, May 10 from 11am to 4pm. Sarah Hayden, owner of West Village Clothing Co, told Essex County Place that "we're doing a grand reopening celebration because there are several new owners in the stores and a lot of renovations/improvements have taken place". A grand reopening ribbon cutting ceremony is scheduled to take place at 12pm, and several businesses will each hold activities throughout the day. Both Renaissance Consignments and West Village Clothing will be holding a sale, and visitors of West Village Clothing participate in fashion crafts. Next door, the Cedar Ridge Cafe and Bakery will host a Barbershop Quartet performance, and there will be an artist making dog caricatures. Milk Money Consignments will have face painting, a sale, and a character visit. Across Ridgewood Road, The Framing Mill will have a photo booth and a sale, and the Stage One Hair Salon will have a basket raffle. Next door to the salon, StudioVert Architecture will host an art exhibit. There will be music outside, and the block will be decorated with balloons. Gefken Flowers will be selling various types of flowers for Mother's Day. 'Ridgewood Row' is located on Ridgewood Road between Audley Street and East Cedar Lane, near the South Orange/Maplewood border. In case of inclement weather, the event will be on Sunday, May 18. The Dollar Variety and Discount Store on Valley Street in Maplewood has closed in order to make way for a new CVS/pharmacy drugstore. Dollar Variety opened in May, 2011, replacing an A&P Supermarket which closed in 2010. The new CVS will be the first South Orange/Maplewood location for the national drugstore. The new store will be 13,346 square feet, and will have a drive-thru window. The project was approved by the Maplewood Township Planning Board, 5-2, back in January. Employees of a sign company were seen removing the Dollar Variety signs from the exterior of the store on Thursday afternoon. A sign on the front door simply read 'Close'. Demolition of the building is expected to begin in the near future.